New Zealand is one of the most breathtaking and unique countries in the world. There are many romantic things to do in New Zealand like; exploring glaciers, relaxing in hot springs, visiting vineyards, discovering beautiful beaches and having a picnic with your lover. Discover New Zealand at your own pace with a campervan adventure! Romance is all about exploring, relaxing, unwinding and finding unique experiences to share with your partner. There is no one we’d rather share these incredible New Zealand experiences with but each other. 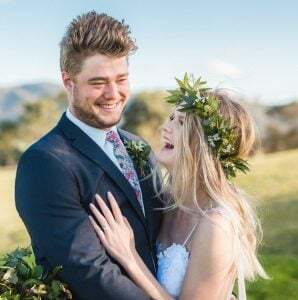 Our New Zealand honeymoon was absolutely incredible, so here are our favourite things to do in New Zeland for couples! Whether you’re on a budget or you’re looking to splash out, we’ve got you covered with eleven romantic things to do in New Zealand. 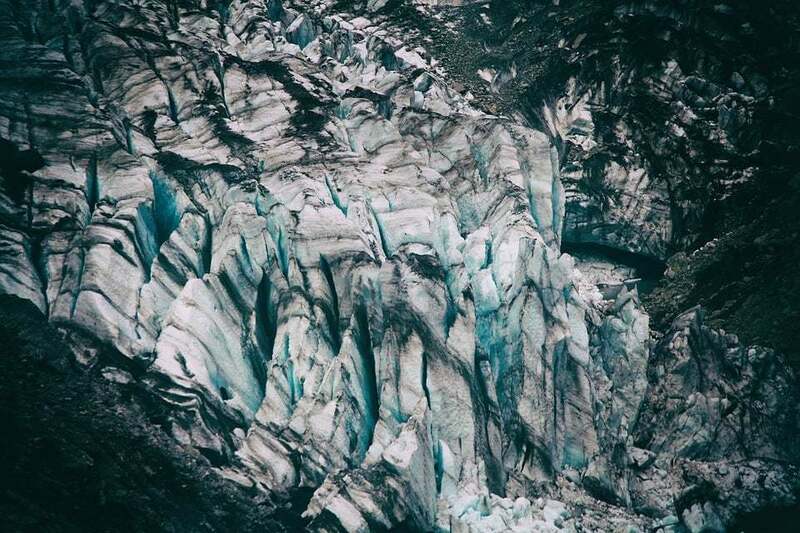 The Franz Josef Glacial region is located on the West Coast of New Zealand’s South Island. The best things to do in New Zealand are for sure in the South Island. 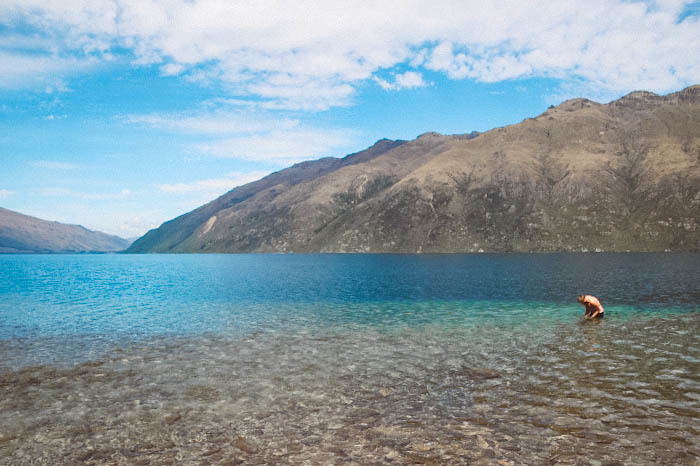 This region has a lot to offer when it comes to walking, trekking, tramping etc. There are numerous tracks scattered throughout the area that cater to all levels of fitness, expertise and time. We decided to conquer the breathtaking Fox Glacier walk. They also offer helicopter tours for those wanting a unique New Zealand experience. However, we decided to go on a romantic walk along glacial riverbeds hand in hand, it was such a romantic experience to share together! The whole region is just magical and we found it super cool to see how the glacier has shaped the earth around it. We finally arrived at the summit and to see Fox Glacier in all her glory was simply incredible. Bright blue ice caves spread along the lower section, as chunks of ice fall from above into the milky, blue glacial river. It was truly an amazing experience and by far one of the best things to do in New Zealand. It was also a bit of an eye-opener once you understand how quickly the Glaciers are melting and see how far they are retreating each and every year. After a few days of climbing, hiking and exploring the Franz Joseph Glacier region, we decided it’s time for a little rest and relaxation. It is our honeymoon, after all, so we are always searching for romantic things to do in New Zealand. There is nothing better than soaking your aching body in a thermal pool and relaxing with a bottle of wine. You can opt to enjoy the hot pools as part of your Heli-Hike Franz Joseph Tour, or just head there yourself! 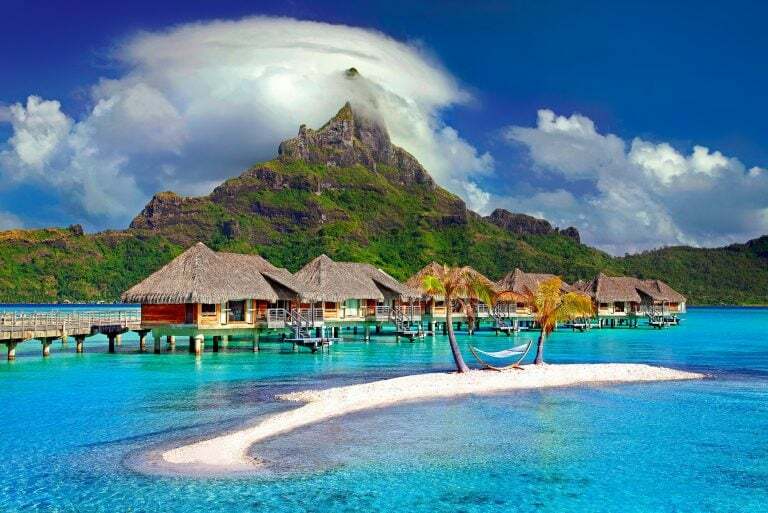 It’s no wonder New Zealand is one of the best honeymoon destinations for couples. If you’re looking for romantic things to do in New Zealand, then book your own private hot pool at Franz Josef Glacier Hot Pools. These perfectly secluded hot pools are nestled amongst the natural New Zealand rainforest and decently priced. We indulged with a couples relaxation massage at Amaia Luxury Spa at the Tewaonui Forest Retreat. Followed by a romantic, candlelit dinner with another bottle (or two) of wine. 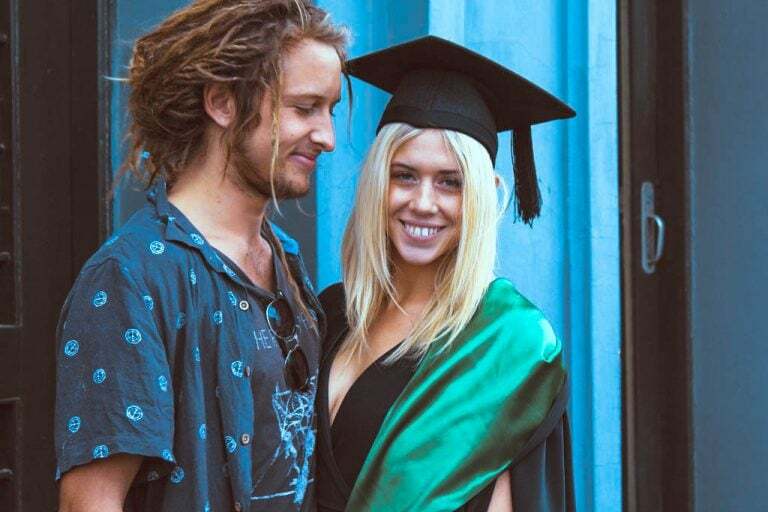 This was such a romantic experience and by far one of the best things to do in New Zealand for couples! Queenstown, oh how we love you! Upon arriving in Queenstown we were overwhelmed by the sheer beauty of this New Zealand honeymoon destination. The city was busy and bustling which was quite a nice sea change. We spent the previous two weeks living the quiet life and cruising around in our campervan. It was so wonderfully busy with so much going on everywhere. Definitely a super fun place and one of the best places and things to do in New Zealand. We spent the Christmas period revelling in all the things to do in Queenstown like hiking, camping, sightseeing, eating, drinking, partying, swimming and more walking. Once the festivities died down and the Christmas rush had ended, we needed to get away. So drove out to a town called Glenorchy and wandered to the top of Lake Wakatipu. As we were exploring Lake Wakatipu we noticed hundreds of tiny beaches spread out along the banks of the lake. We found our own tiny, private beach with enough room for our campervan. So we set up camp for the day, put some tunes on, opened a beer and had the most serene picnic you could ever imagine. Sitting on the pebbly beach with no people, no buildings and no road in sight… This was just what we had been searching for! 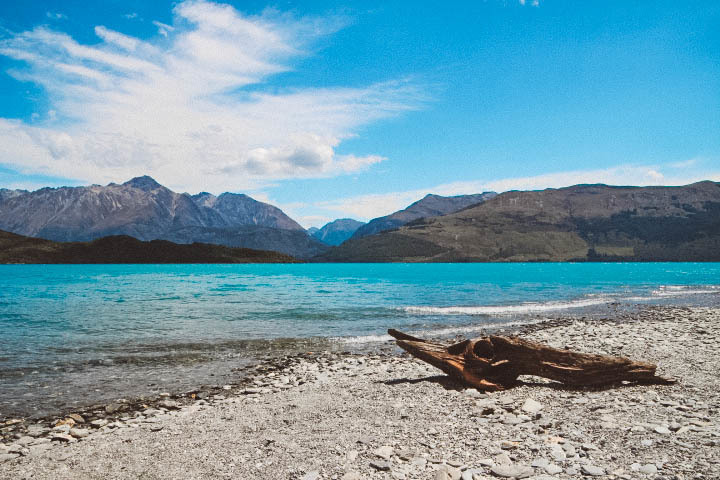 So if you’re looking for romantic honeymoon experiences, a picnic at Lake Wakatipu is one of the best things to do in New Zealand. Swimming in the clear, icy water, gazing upward at the picturesque mountains was a moment of tranquillity we shared together! I’ll be honest, we love a drink and we love our wine. Especially the wine from the Marlborough region in New Zealand. Take a trip to the number one vineyard region on your honeymoon travels in New Zealand. This is possibly one of the best things to do in New Zealand’s South Island, especially if you’re a wine lover or connoisseur. We visited three beautiful wineries on a lovely sunny day, roughly a 30-minute drive from Blenheim. But, there are such a multitude of wineries to visit, the hardest part of your day will be fitting in as many as you can! Your best option is a Marlborough full-day vineyard tour, this enables you to enjoy yourself without having to worry about drink driving. If you’re looking for a little extra romance, head to the oversize bean bags at Cloudy Bay Winery. Dabble in delectable wines and pair it to perfection with a tasting rack while relaxing on the grass and overlooking the vineyards. They have a decent selection of platters to choose from, which are perfect for a sunset snack! Villa Maria, Cloudy Bay and Brancott Estate are all fantastic vineyards in New Zealand’s Malborough wine region. Prices range from winery to winery so it pays to do a bit of research before arriving at the cellar door, that way you know it suits your budget. For us, the best part of visiting wineries is the bottles you collect along the way! If you’re planning on visiting the wineries, make sure you choose a nice day, taste as many as you can, buy the ones you love and be sure to leave your car keys at home. 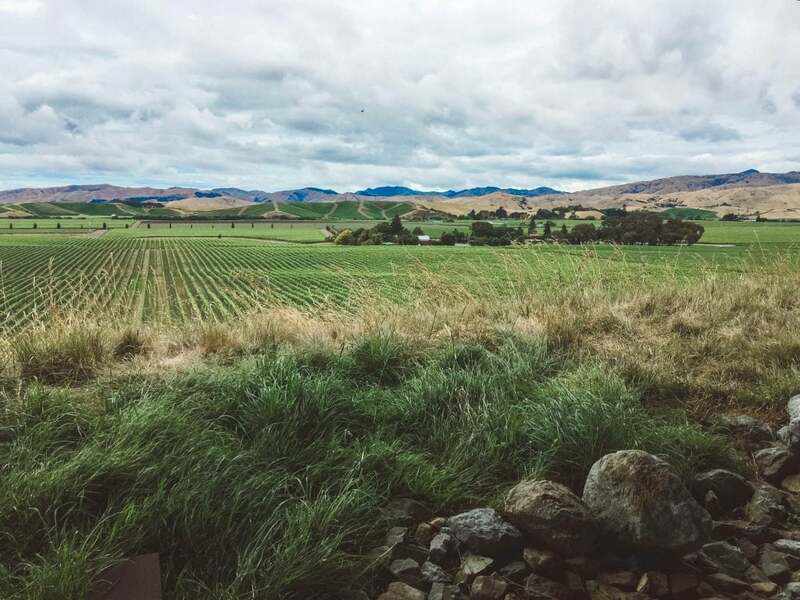 Whether you book a tour or do your own thing, the South Island vineyards in Marlborough is one of the best things to do in New Zealand, especially for couples. Rarangi beach is situated at the very north end of the South Island in the Marlborough region, just a half hour drive from Nelson. The entire area is absolutely stunning with jagged rock formations leading to numerous beaches with huge crashing waves. Here we spent three days exploring the many beaches and walking tracks around the area. It wasn’t until speaking to an older, local man that we learned of a more undisclosed place where you can find limestone caves and glow worms. His directions weren’t 100% but we eventually came across the most beautiful entry to a cave, through the rainforest. Climbing down into the wet, cold cave with endless stalactites surrounding us was absolutely amazing! Exploring into the unknown with just the two of us, was one of our favourite memories and one of the best things to do in New Zealand. Don’t be afraid to go out of your comfort zone and search for hidden gems spread throughout New Zealand. 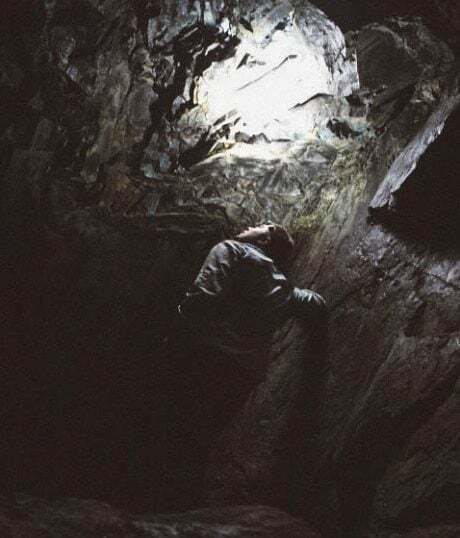 You’ll save yourself a lot of hassle by taking glow worm cave tour however, you won’t have the cave to yourselves… We were in pure serenity laying on the cave floor looking up at the dark, jagged, rock ceiling. After about minutes you can see hundreds and hundreds of the phenomenal glow worms. This was one of the most surreal experiences and best things to do in New Zealand. If you’re honeymooning in New Zealand, you have to find time to visit the awesome little laid back city Dunedin. There are so many incredible things to do in New Zealand, especially on the South Island. Just east of Dunedin is the beginning of the Otago Peninsula and we had no idea it even existed. Whilst driving past we saw some signs and thought… Why not?! Immediately we were blown away by the incredible views of the Otago Peninsula, especially from the top of the hills. We then stumbled upon this beautiful little town, Portobello. It’s a tiny little farming community that backs directly onto a small harbour town, with the most incredible views! It was a perfect place to pull up and camp for the night if you don’t have that luxury, take a day tour of the Otago Peninsula. We absolutely loved this area so we kept on driving east, all the way to the Royal Albatross Centre of New Zealand. Here we caught our first glimpse of albatross and sea lions in the wild. Which was pretty amazing which is why it’s our pick for one of the best things to do in New Zealand. Although the weather took a turn for the worse, we kept on cruising the coastline, southward to Cape Saunders. We took the walking track from Allen’s Beach to Hooper’s inlet to try and track down some furry friends. Within minutes of walking, we had more than ten sea lions in our sights, all of them relaxing on the beach and soaking up some summer rays. We were soon confronted by a 2.5m+ male sea lion who rapidly swam towards us, jumped out of the water and let out a terrifying roar. He was just marking his territory and we didn’t want to get in his way, so snapped a quick picture and backed away. 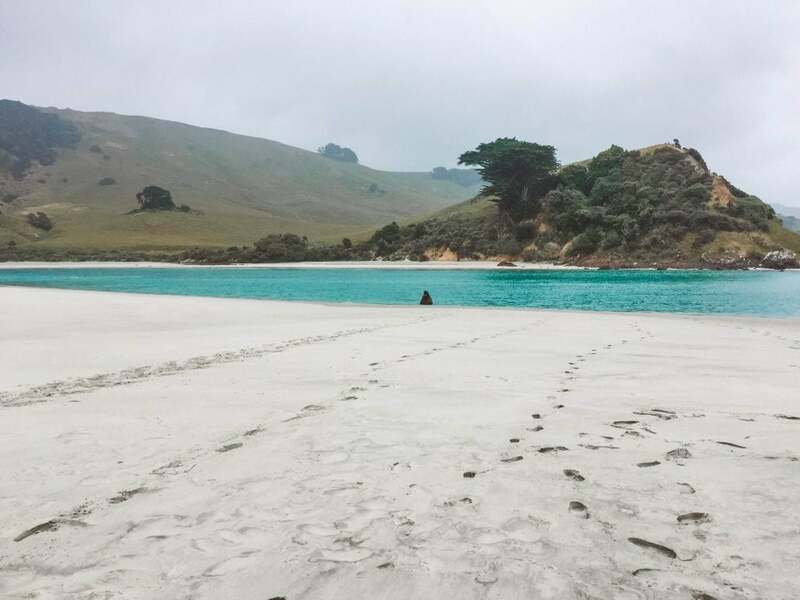 This small area of New Zealand is right up there with our favourite little spots in the world and one of the best things to do in New Zealand – South Island. 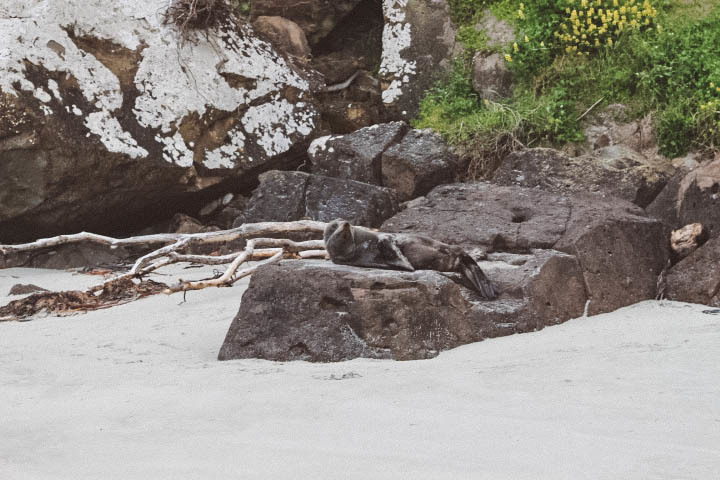 The Otago Peninsula is a completely unspoiled location, where you can get all close and personal with some of New Zealand’s most breathtaking wildlife. As you can probably guess by now, we love being in and around the water. Waterfalls always make us happy, especially if there is a rock perched on the edge where Billy can do backflips into the water. 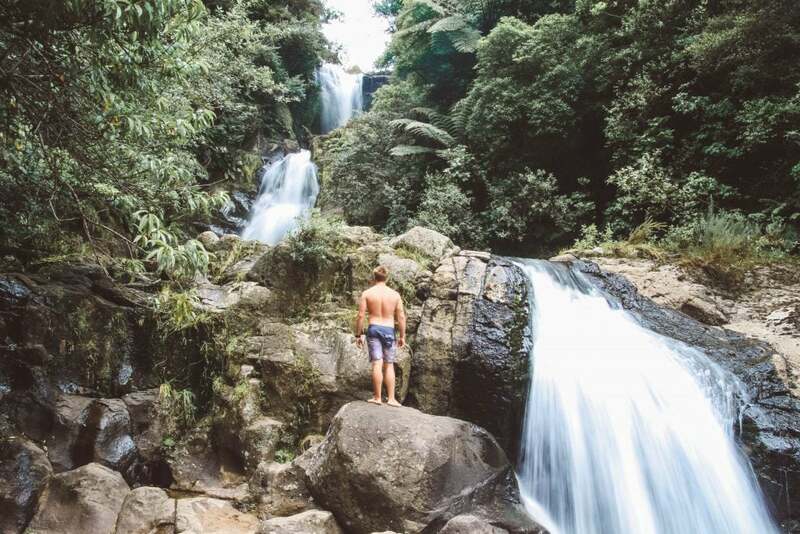 There are so many waterfalls to explore and things to do in New Zealand however, Kaiate Falls would have to be one of our favourites. Kaiate Falls is about one hour north of Rotorua on the North Island of New Zealand. It’s a bit of a steep walk from the carpark but definitely worth the effort. The waterfall has three sections which are all absolutely stunning! If you’re looking to cool off after your walk, there’s a lovely swimming spot at the bottom of the falls. Make sure you continue along the track to the base of the falls for a picnic and swim on the river banks. It’s a really romantic date idea and one of the best things to see and do in New Zealand! Lake Taupo is absolutely incredible and is one of the top things to see in New Zealand. The enormity of the place was unbelievable and the history of how it came to be is just amazing! 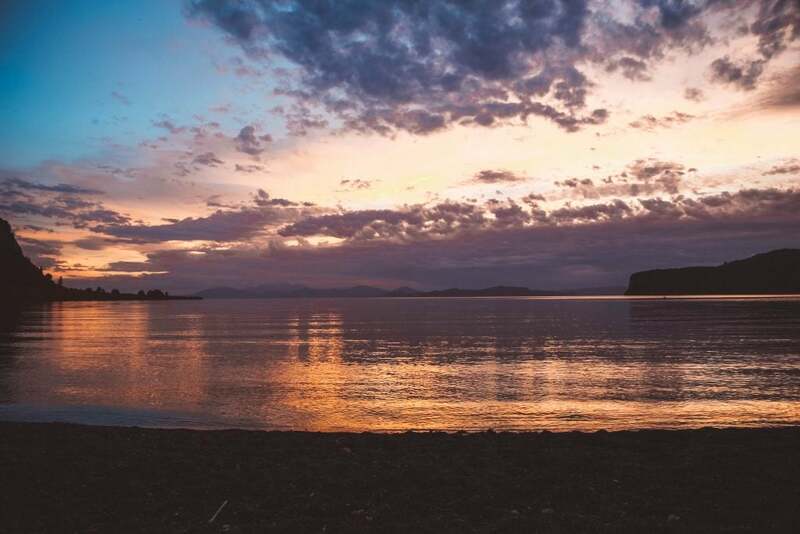 Did you know that Lake Taupo was created by the world’s largest volcanic eruption of the last 70,000 years? It was overwhelming to be surrounded by such a marvellous natural wonder of the world. Lake Taupo is situated in the centre of the north island of New Zealand, roughly one hour south of Rotorua in the town of Taupo. It is the largest freshwater lake in New Zealand which means there are a plethora of banks you can explore and bays to swim in. First, we stopped into Kinloch and swam in the pristine waters of Whangamata Bay. You’ll notice the difference in the clarity of the water here compared to the water’s edge at the town centre, it’s immaculate and so beautiful to swim in especially with the pontoon on the water to jump off! No wonder it’s one of the best places to see in New Zealand. After our refreshing swim, we found a spot to camp at Whakaipo Bay and camped just 100 metres from the water’s edge. It was such an incredible spot to camp and so secluded even in the middle of summer. Everyone left before sunset, so it was just us on the banks of the lake taking in the most spectacular New Zealand sunset. 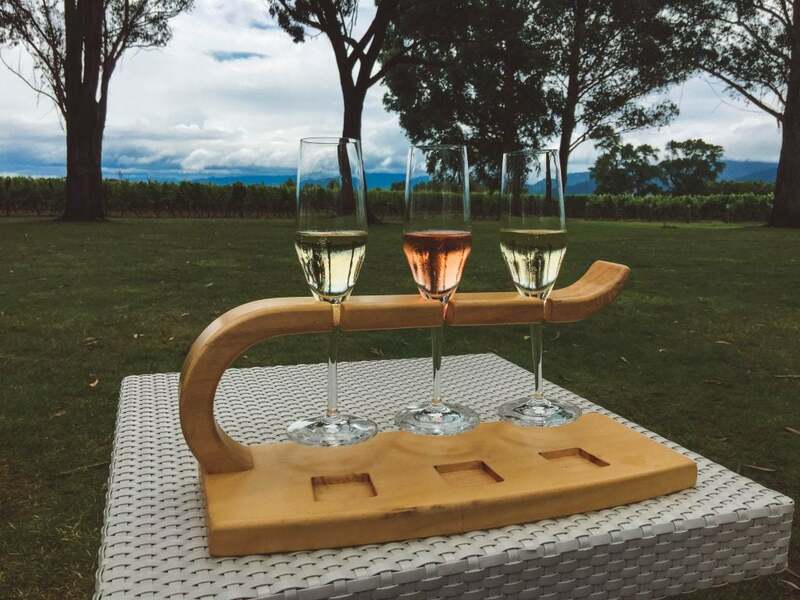 Make sure you grab your favourite New Zealand wine and some cheese for an absolutely perfect romantic picnic on the edge of Lake Taupo. Enjoy an evening or morning swim in the warm water with views to die for, it’s one of the most romantic things to do in New Zealand. There are so many things to do in New Zealand at Lake Taupo. 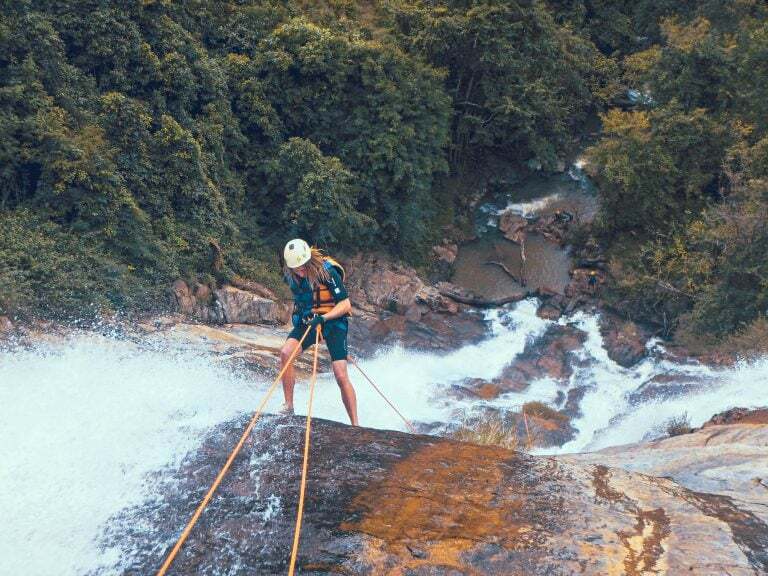 Set off on an adventure with jet boat rides, white water rafting or a scenic helicopter tour. Perhaps you’re after something a little more romantic? Why not take your lover on a sunset sailing cruise over Lake Taupo. There are just so many incredible things to do in New Zealand at Lake Taupo, it’s a destination definitely worth seeing! The Coromandel Peninsula is an incredible part of New Zealand. With spectacular beaches, pristine waterfalls, rivers, and picturesque coves, it’s definitely a must-see New Zealand destination! Although we’re on our honeymoon in New Zealand, we abducted a friend to join us for the long weekend. We spent hours and hours, exploring various beaches around the area. However, we had nowhere near enough time to see them all. Hot Water Beach was by far one of the best places to see in New Zealand. As the name suggests the water is actually hot as it sits on a geothermal hot spring. The water bubbling into your little pool can reach temperatures of around 65C (147F), so remember to take regular dips in the cool ocean. 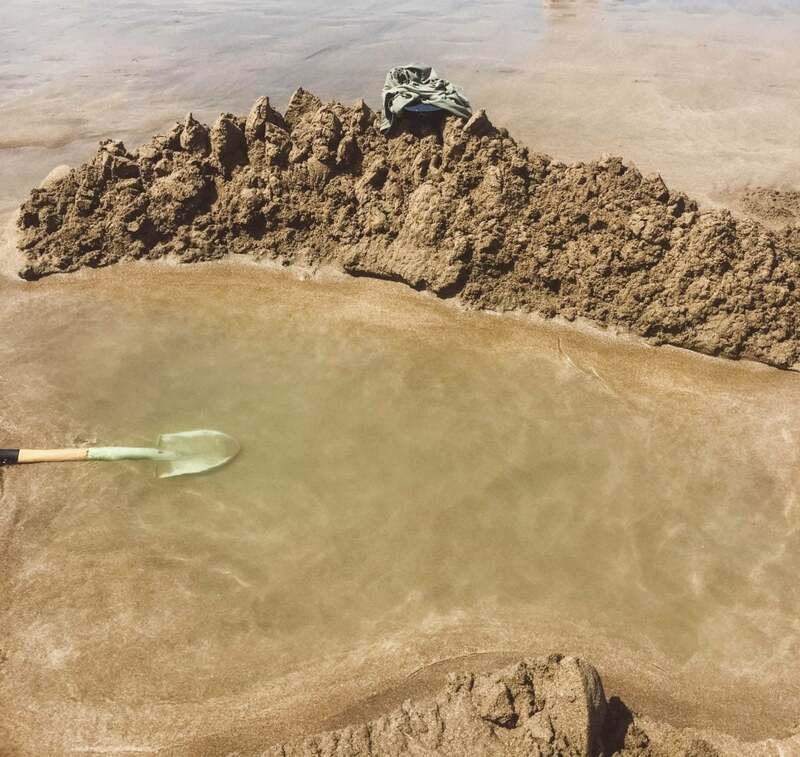 Hot Beach contains two large underground fractures in the earth, that allow geothermally heated water to rise up and filter through the sand. 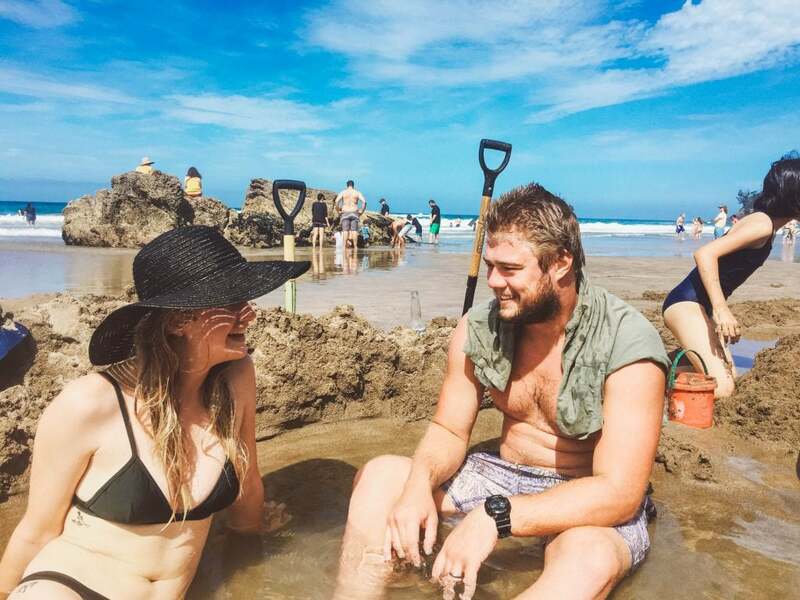 This beach has become a little hub for travellers who bring their shovels to dig up their very own private hot spring. It was such a relaxing afternoon, soaking up those natural minerals in our very own private hot spring. 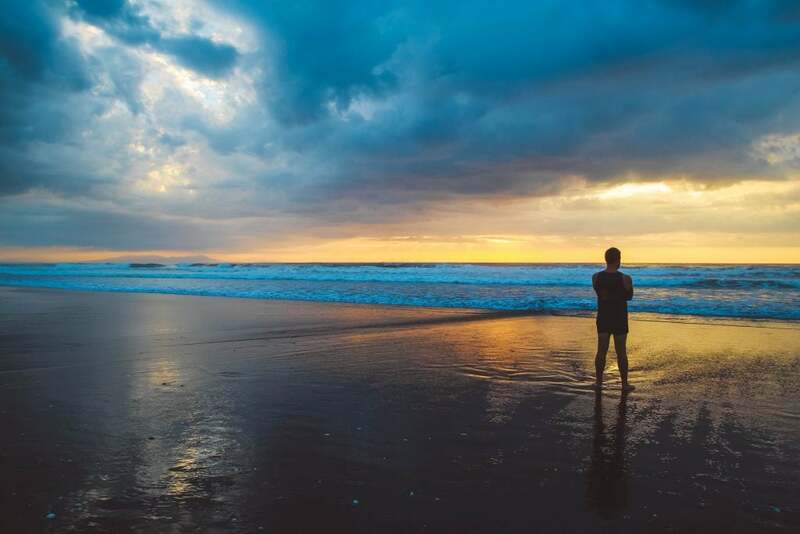 Make sure you check the tides to determine the ideal time of day to visit Hot Beach, New Zealand. We stumbled upon the tiny town of Mokau nestled between New Plymouth and Hamilton. 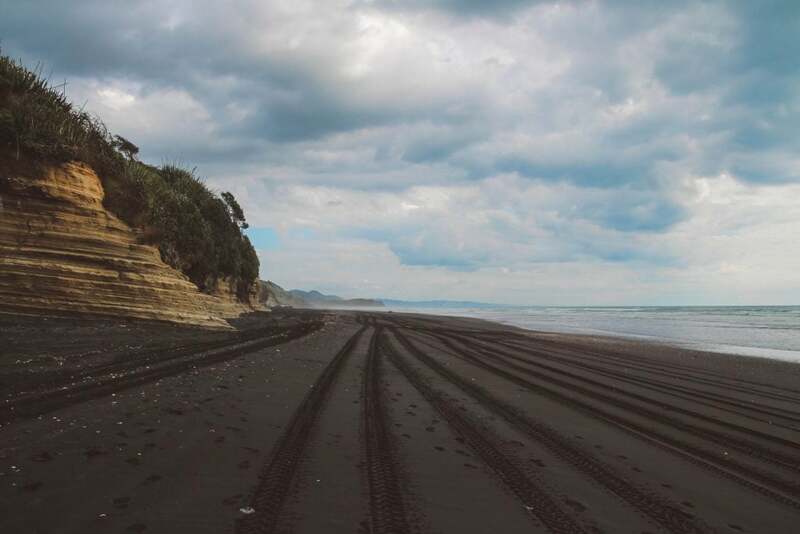 Mokau is home to breathtaking black sand beaches and the most incredible sunset. It’s one of the best things to do in New Zealand if you’re travelling the North Island. After looking everywhere for a free campsite we caved and pulled into the Seaview Holiday Park. We parked just 20m from the sand and immediately went for a dip in the warm ocean. We spent hours walking the black sand beach, totally in awe of its natural beauty. The sand is some of the blackest we’ve ever seen and it glistens in the sun. It’s honestly the softest, yet heaviest sand we’ve ever felt. It’s such a special place and one definitely a top pick for the best things to see in New Zealand. The sunset over the black sand beach is one of the most magical we’ve ever encountered. 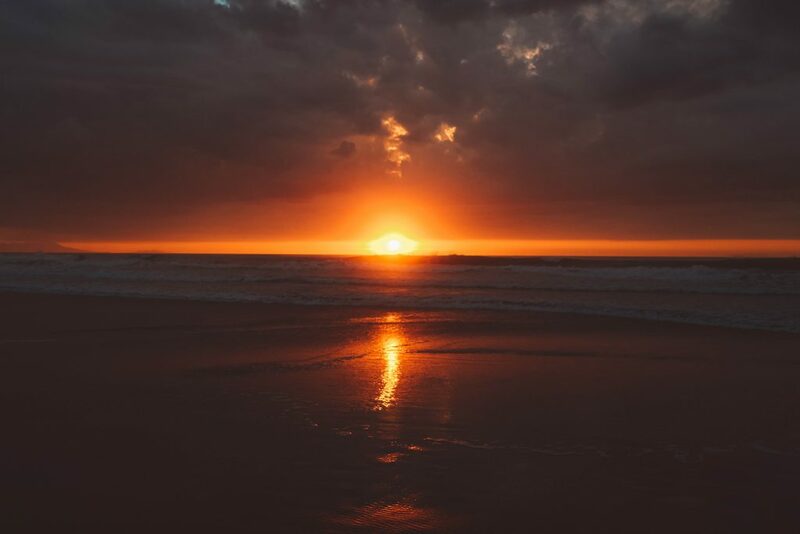 We’d return back to Mokau again, just to witness this sunset, one more time. Northland is one of our favourite regions in New Zealand! The people, winding roads, epic sunrises, surreal sunsets, campsites and waterfalls are simply incredible. Matapouri, Tutukaka and The Bay Of Islands were also among some of the best things to do in New Zealand. The scenery and general atmosphere of the towns we visited, was something else. We drove through this area and decided to come back numerous times because we loved it so much. The Bay of Islands is utterly breathtaking and totally worth checking out. A major standout on our New Zealand travels was Rainbow Falls. 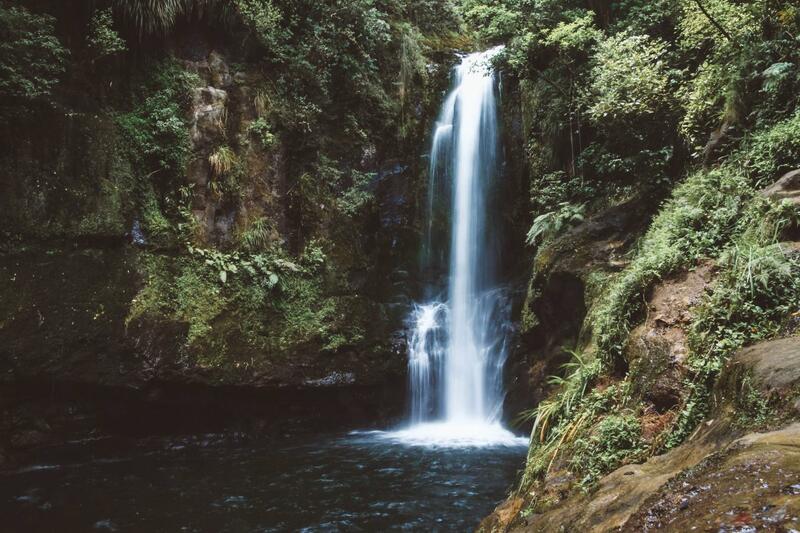 It’s tucked away off the Heritage Bypass and probably the best waterfall we’ve seen in New Zealand. It was was like something out of the movies… After the short walk to the bottom of the falls, we were greeted with an amazing rainbow. With the sun shining bright with a perfect amount of mist from the crashing falls below, Waianiwaniwa put on a beautiful rainbow display. 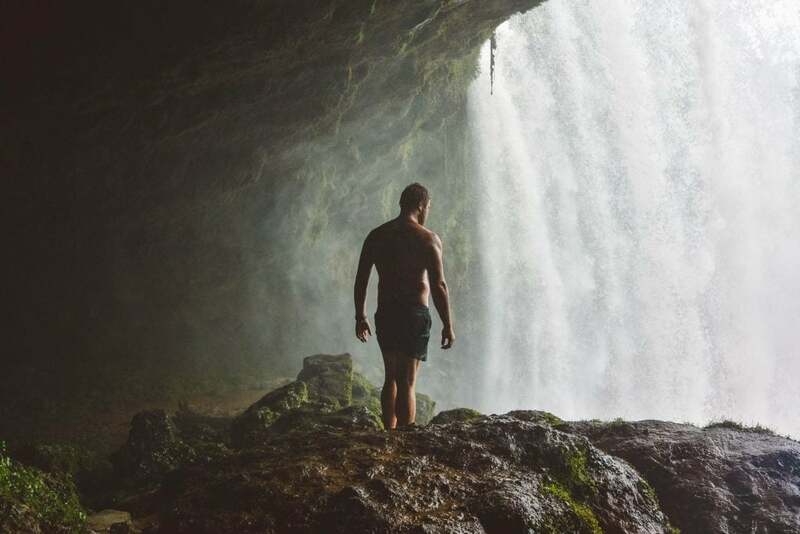 We swam across the large pool at the bottom of the falls, climbed up and around the rocks to find ourselves in an enormous cave behind the waterfall. Although it was a bit sketchy climbing up the slippery rocks with water crashing down on you, it was was a truly amazing experience!